The best review of Blackheath’s pubs for a long time… He’s right, you know. This problem has come up before, and has been solved! The rail cuts are going ahead. I think it’s a great idea – those trains are so spacious during rush hour, I never know what to do with all that leg room. Local councillor Godfried Gyechie reckons we should go and grumble at the managers on 12 November at Cannon Street. I’m not so sure that it will make any difference. The train companies are only doing what they can get away with, based on legislation drawn up by government. If they could stick us all into a single cattle truck, I’m sure they would. So his other suggestion of emailing the transport minister is a much better one – or you could tweet him. Bits about Blackheath at 2 minutes 43 seconds in. Guardian review of the programme here. Angry activist review here. What an amazing photo of Blackheath in the fog. Looks like the beginning of a detective novel to me. Completely terrific foggy photos of Blackheath by Changwoo Ryu. Have a look at all the others too… Great stuff. (Photo used by kind permission). 853blog had a great post criticising the weakness of local media in the SE, and Greenwich Time specifically. Also raises some very good points about the cost of entry into local societies, such as The Blackheath Society and The Westcombe Society. Whilst these groups have reasonably low membership fees (Blackheath’s is £15 per year – can’t find any record of Westcombe’s), it effectively acts as a barrier to entry for all local residents. In some respects there are comparisons to be made between local papers and local residents societies. Both began in a similar time in history, when distribution and organisation of information was expensive, and had variable costs depending upon the number of users. The changes needed for the press to adapt to the information age have been endlessly written about, but maybe the same is true of local societies? There could be a case for making them entirely free – most of the infrastructure costs that they used to rely on are now available online next to nothing. I don’t understand why they don’t open up their historical archives for everyone, not just subscribers, or a few people in a small room to admire. The Blackheath Society has a spectacular collection of historical photos, that should be made available to all. In this era, to restrict them to analogue only copies is backward at best, and runs the risk of alienating younger potential volunteers getting involved. Just to alert you to the Page Estate Blackheath Residents’ Facebook group I set up a while ago, for all freeholders, leaseholders and tenants of the Page Estate in Blackheath, to discuss issues of common interest (repairs, etc). I’d be grateful if you could publicise it on the Bugle. The Blackheath Page Estate (not to be confused with a council estate in Eltham) is a privately owned ‘estate’ in parts of Lewisham and Greenwich Boroughs — eg some Victorian properties on the Lewisham side of Lee Road, the communal garage areas attached to the Span houses in Lee Road, Heathlee Road, Foxwood Road, some Victorian properties in Lee Park and Lee High Road, then some other Victorian properties over the other side of the heath in Beaconsfield Road, probably other roads too. The properties are dotted around (it’s not a self-contained, specific area as such). The management office is in Beaconsfield Road. Residents are getting increasingly frustrated by the poor response (and often lack of response) to requests for repairs, and that’s why I set up the group. The Victorian house I live in contains four flats, two on long lease and two rented, and no external maintenance has been done since 1995/6. We’d very much appreciate a bit of publicity so that more people will be aware of the group and hopefully join it. 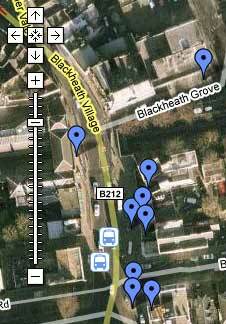 If anyone else has set up residents groups for their estates in Blackheath, please let me know and I’ll add a link here. UPDATE: Normally I’d suggest my Map of Parking in Blackheath, but with 65,000 people predicted, it’s probably better to leave the car at home. Hello, back finally! 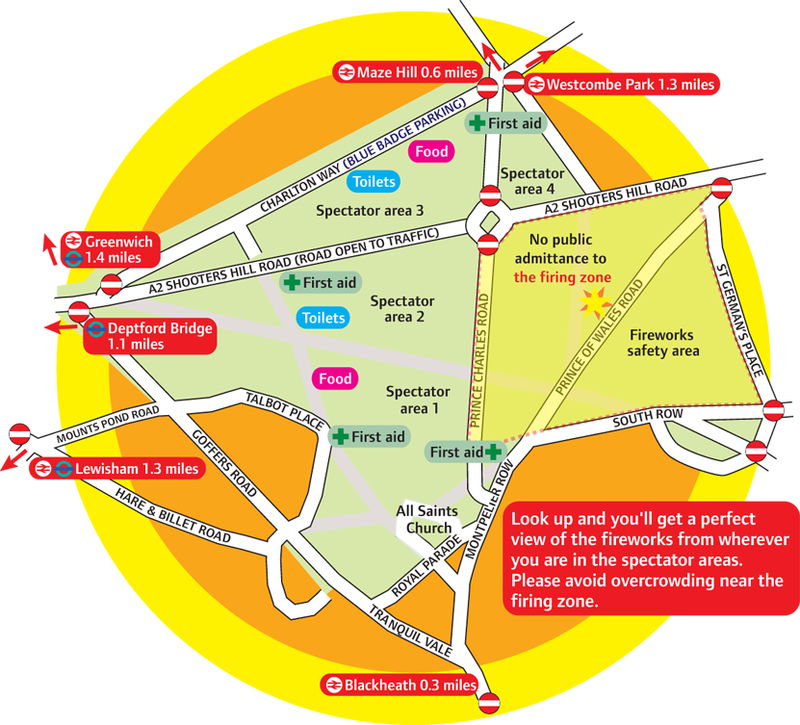 Here’s the latest missive from the council about the fireworks on Saturday 7 November at 8pm, complete with a map! The Blackheath fireworks display is always a popular event with local residents although last year we received several complaints that roads closed and the firing zone had changed without sufficient advanced information. We have had meeting with the organisers and hope this year communications with local residents will be better. It is one of the most dazzling displays in London, bringing colour and light to the skies of Lewisham and Greenwich. This year’s event, which is free, will be held on Saturday 7 November at 8pm. It will be a full 30 minutes long and will feature a vast array of fireworks in a dazzling range of colours, set perfectly to music. International food and drink will be available throughout the evening so you can make a night of it. * Leave your car at home – there is no parking on the heath and traffic enforcement is in operation in surrounding roads. Only Blue Badge Holders can park at the event. Many roads in the area will be closed from mid afternoon. * Do not buy items, especially fireworks, from unauthorised traders who may operate at the event. Illegal traders sell unchecked merchandise that may be dangerous.